So many times, we take such things as the freedom and independence that we have in these United States for granted, because we do not know what it is like to live without it. And why is that? It is because of all the branches of our military, those who have voluntarily made the commitment to fight for each and every citizen of this nation. During November, we celebrate Veteran’s Day, and we are reminded of all the men and women who make sacrifices to maintain our freedom. This sacrifice could be in the form of time lost with one’s family and friends, time spent recovering from wounds both physical and mental, or even the loss of one’s life, all so that the rest of us can continue to enjoy the freedoms and privileges of these United States. This quarter, for our Hometown Hero, we have chosen to honor not only those who have fought and given their lives for our country, but also those who continue to give of themselves each and every day to ensure that all the citizens of the United States continue to live in a free country. On the Alamance County War Memorial, which was erected in 1996 and is located in Graham in front of the Criminal Courts Building, the names of all those from Alamance County who have given their lives in defense of our freedom are listed. This includes 235 souls during the Civil War, 2 during the Spanish-American War, 96 during World War I, 179 during World War II, 14 during the Korean War, 42 during the Vietnam War, 1 during the U.S.S. Liberty attack, and 3 during the Middle East conflict. Regretfully we do not have enough space to list all 572 names here, but we do encourage each and every one of you to visit this memorial and pay tribute to all of those brave men and women from right here in Alamance County who have given so much for those they do not even know. But so often those who have not given the ultimate sacrifice of themselves go unnoticed, retiring from the military and moving on with their lives, nameless, but not forgotten. These are people who are deserving of our thanks, respect, and honor. According to the records of the United States Department of Defense, there are 771, 654 veterans currently living in the state of North Carolina. 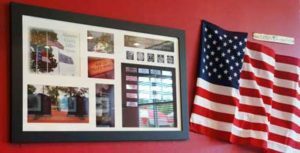 We would like to invite all of those veterans who come in and dine with us to list their name, military branch, and rank so that we, as a community, can thank you personally for your commitment to our great country.